The Microsoft site is somewhat unfriendly to navigate when you need to grab a language pack in a language you are not fluent in. The interface changes to the language you pick in the drop down lost, then you need to guess where the download button is located and then switching back to your language is also tricky because the languages list is now localized to the display language. This had always been one of the things I disliked about setting up SharePoint. One day I came across a post on Twitter by @SharePointRyan that listed a powershell script that downloaded all the language packs at once. That gave me the idea to package this up in a user friendly interface to download the language packs you need by making your selection with check marks. The tool automatically grabs your files from Microsoft and names them appropriately. Over the last little while there have been revisions to allow downloading the SharePoint 2010 Foundation Language Pack files as well as the Service Pack 1 and Service Pack 2 updates for these language packs. 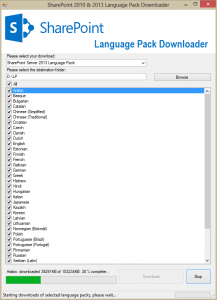 In June 2013, Microsoft released the public downloads of SharePoint 2013 Language Packs. The tool was updated to version 2.0 to handle these downloads. Please let me know via the comments or via Twitter (@matdesmarais) if you are experiencing any issues using this tool. I am also open to suggestions so let me know if there are any features you would like to have added. This tool was featured in Todd Klindt’s Netcast #88: http://toddklindt.com/blog/Lists/Posts/Post.aspx?ID=282 Thanks Todd! Excellent work Mat, makes the process much easier!